On Thursday, the 5th of March it was officially announced that Pope Francis has confirmed the election of Cardinal Luis Antonio Tagle as the new President of the Catholic Biblical Federation. Luis Antonio Gokim Tagle was born in the Philippines, in Manila, on the 21st of June 1957, to a Chinese mother. He studied philosophy at St. Joseph´s seminary Manila and graduated from the Athenaeum of the University of Manila. He was ordained a priest for the Archdiocese of Manila on the 27th of February 1982. For some time he ministered in parishes and seminaries – in one of which he was rector. He was sent to the Catholic University of America in Washington D.C. to complete his studies (1987 – 1991). There he received his doctorate in Theology having defending his thesis on the notion of episcopal collegiality according to the Second Vatican Council and the influence of Pope Paul VI on the same. In 1997 he was appointed as a member of the International Theological Commission. He then worked in various parishes and taught theology in four seminaries for some years when Pope John Paul II on the 22nd of October 2001 appointed him bishop of Imus, a diocese of 2.6 Million Catholics. On the 13th of October 2011 he was appointed Archbishop of Manila. Cardinal Tagle is a theologian, and a much sought after conference giver. He has collaborated with Giuseppe Alberigo on The History of the Council, a work in which he expounds his vision for the Catholic Church in the third Millennium. He was made cardinal on the 24th of November 2012, at the age of 55, receiving the red biretta and the title of San Felice da Cantalice a Centocelle. In the Roman Curia he is a member of the Pontifical Commission for the family, (he is president of the committee), and for Pastoral Ministry to Migrants and Travelers. Cardinal Tagle has participated in various Synods of the Vatican (1998, 2005, 2008 and 2012). In the Synod on “The Word of God in the Life and Mission of the Church (2008), he was a very active participant with his famous statement: “A Church which does not listen to the poor cannot celebrate the Word of God”. Monsignor Tagle has a television program “The Word Exposed” which has been running in the Philippines since 2008. There, each week, he comments on the readings of the Mass for the following Sunday. He is also the most popular cardinal on Facebook. As well as being an academic, Cardinal Luis Antonio Tagle is a singer and composer. You can find on YouTube some of his Christian musical compositions which he performs himself. 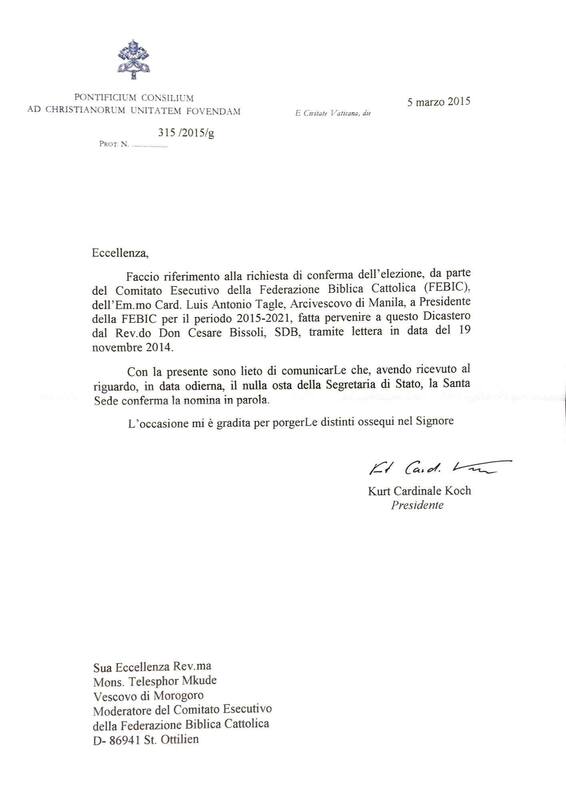 At an ordinary meeting of the Executive Committee of the Catholic Biblical Federation, this took place in Rome on the 24th – 25th of October 2014; Cardinal Luis Antonia Tagle was elected unanimously President of the Catholic Biblical Federation. The election was confirmed by Pope Francis and made public on the 5th of March 2015. 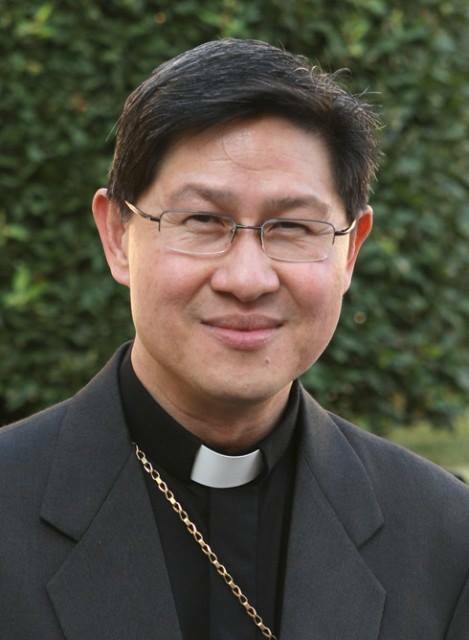 Cardinal Tagle will take possession of his new responsibility during the Ninth Plenary Assembly of the Catholic Biblical Federation which will take place in Nemi (Italy) from the 18th – 23rd of June of this year. He will succeed Archbishop Vincenzo Paglia, who has been President of the Catholic Biblical Federation since September 2002.